Heyspeak is a conversation course for false-beginners and intermediate-level English learners. Everyday conversation topics are introduced through a series of discussion questions, useful idioms, word puzzles and creative writing and speaking exercises- developing fluency and building vocabulary skills. 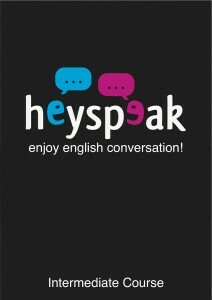 Heyspeak is available as a free download to all Global English House students. Please click on the book cover above and enter the password provided by your teacher to download your free digital copy.